The Habsburg dynasty used the archducal hat on several occasions, such as the homage paid by the estates. Since the 16th century, it was worn as a sign of their rank as archdukes of Austria in the procession prior to the Imperial coronation at Frankfurt am Main. Since the custodians of the archducal hat at Klosterneuburg Monastery refused to allow the archducal hat to be used by Joseph II for the procession preceding his coronation at Frankfurt am Main in 1764, a new archducal coronet had to be created. 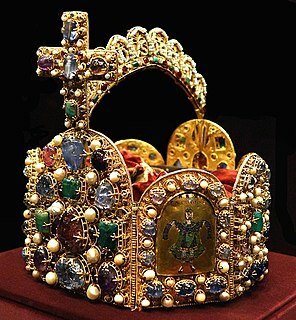 This new coronet didn't follow the pattern of the hat in Klosterneuburg. It consisted of a golden eastern coronet with pearls and precious stones. A flat velvet cap encircled by ermine was included. Having only one arch, it resembled the original archducal coronet introduced by Rudolph IV of Austria. At the center of the arch, it is surmounted by a globe and cross. After the coronation, the coronet became obsolete. The jewels and pearls were removed and were used for other purposes. Its frame, however, survived and can be seen in the Secular Treasury of the Hofburg in Vienna. Its original state can be seen in a contemporary painting of Joseph II. ^ Lord Twining, Edward Francis: European Regalia, B.T. Batsford Ltd. London, 1967. p 141. Klosterneuburg German pronunciation: [ˈkloːstɐnɔɪ̯bʊʁk] is a town in Tulln District in the Austrian state of Lower Austria. It has a population of about 26,000. The Klosterneuburg Monastery, which was established in 1114 and soon after given to the Augustinians, is of particular historical importance. Klosterneuburg Monastery is a twelfth-century Augustinian monastery of the Roman Catholic Church located in the town of Klosterneuburg in Lower Austria. Overlooking the Danube, just north of the Vienna city limits at the Leopoldsberg, the monastery was founded in 1114 by Saint Leopold III of Babenberg, the patron saint of Austria, and his second wife Agnes of Germany.